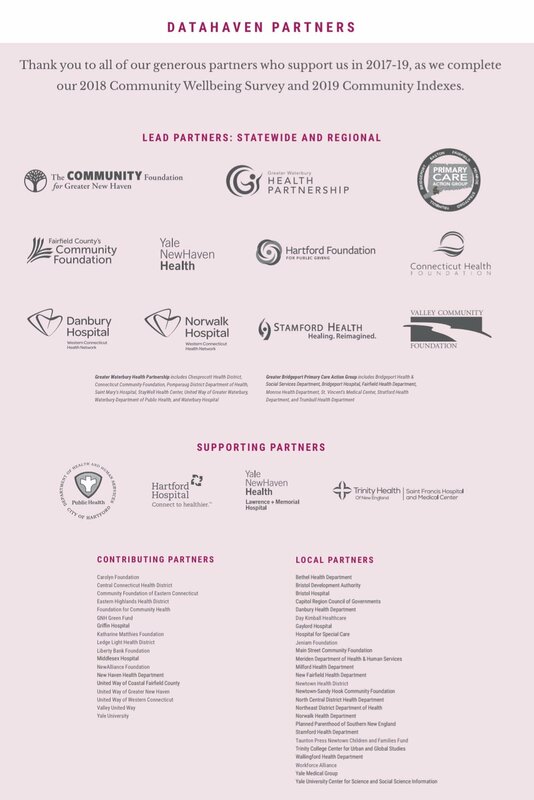 Survey funders include over 80 state and local government, health care, academic, and community partners throughout Connecticut, and Advisory Council members represent 125 partners. The DataHaven Community Wellbeing Survey traces its origins to a series of grassroots and locally-based efforts conducted over the past two decades to gather information on well-being and quality of life in Connecticut's diverse neighborhoods. With guidance from DataHaven and an Advisory Council of more than 125 public and private organizations, these area surveys grew substantially each year in size and quality, and became increasingly coordinated. To create a unified statewide survey, DataHaven developed this network into a formal partnership and chose validated questions from national and international surveys to allow comparisons to benchmark data. The survey is now a nationally-recognized program that provides critical, highly-reliable local information not available from any other public data source. In 2018, we have repeated and expanded this innovative program with support from 80 public and private partners throughout Connecticut. Once again, over 16,000 randomly-selected adults in every town in Connecticut have participated in live, in-depth interviews. Please contact us for more information. Data for individual towns and regions is currently being reviewed by partners, and will be posted on this site (see Index page) in 2019. In 2015, DataHaven expanded the Community Wellbeing Survey to encompass the entire State of Connecticut and sections of New York State, while retaining its mission to produce high-quality neighborhood-level and regional estimates for major metropolitan areas throughout the state, including Greater New Haven, Greater Bridgeport, Lower Fairfield County, Greater Hartford and New Britain, Southeastern Connecticut, the Naugatuck Valley, and other areas. The program completed in-depth interviews of nearly 17,000 randomly-selected residents in 2015. The 2012 Greater New Haven Community Wellbeing Survey was the most comprehensive regional survey ever conducted in Connecticut. In 2012, our researchers asked 1,307 randomly selected adults living in New Haven and 12 surrounding towns what they thought about a variety of issues related to well-being, quality of life, and public health. Concurrently, an additional 1,300 residents in six New Haven neighborhoods were randomly selected and interviewed in person through a survey conducted by the Community Alliance for Research and Engagement. The combined dataset of 2,600 responses is a valuable resource to help understand our region and has been widely used by all sectors of the community. The survey is developed with input from leading national and statewide experts in survey research, as well as an Advisory Council of over 125 public and private organizations throughout Connecticut. The Research Advisory Committee includes Sue Starkey, Northeast District Department of Health; Don Levy, Siena College Research Institute; Amanda Durante, Connecticut Department of Public Health; Brita Roy, Yale University; Byron Kennedy, New Haven Health Department; Mark Abraham, DataHaven; Jennifer Calder, Stamford Health Department; Lisa Morrissey, Danbury Health Department; Russell Melmed, Ledge Light Health District; Amy Carroll-Scott, Drexel University; Tung Nguyen, City of Hartford HHS; Brian Weeks, New Haven Health Department; Shayna Cunningham, Yale University, Kathleen Duffany, Yale University; Emily Wang, Yale University; Victor G Villagra, University of Connecticut; Danya Keene, Yale University. Advisory Council members include representatives from public and private organizations throughout the state. The full list is available on request.